UNITED NATIONS, November 26 -- With questions mounting about the registration process for the Southern Sudan secession referendum scheduled for January 9, the UN is withholding basic information about the Panel to which Secretary General Ban Ki-moon “outsourced” key parts of the UN's role. At media briefings by Ban's spokesperson, Inner City Press has asked about how the Panel is funded, which registration sites they have visited in the United States, Canada, Ethiopia and Kenya, and whether they are implicitly trying to blame the SPML for under-registration of Southern Sudanese in the Northern part of the country and/or in the eight “diapora” countries in which polling would be held. UN acting Deputy Spokesman Farhan Haq has declined to answer many of these questions, referring instead to a separate spokesperson's office set up for the panel. While Inner City Press has sent this “outsourced” office two recent rounds of questions, only one has been answered, and then only partially. This seems to be a pattern at the UN -- to name a Panel and then refuse to answer questions about the subject matter outsourced to the Panel. Left unanswered for example is when the registration site in four of the diaspora countries -- Australia, Egypt, Uganda and the United Kingdom -- will be visited and by whom, how much Panel chair Benjamin Mkapa has been paid and by whom, and what he meant when he blamed “some Southerners” for blocking registration in the North of Southern Sudanese. How many people work for the Panel? How much has thus far been paid to these people and to each of the three Panelists? How much of this has come from the Basket Fund, and how much through UNMIS? What is the status for each donor or pledger to the Basket Fund? As asked November 19, has a vote by the Basket Fund group been taken regarding funding the Panel? If not, why not? How much has been paid from the Basket Fund (or UNMIS) to IOM? In which of the eight diaspora states have registration sites actually been visited? Please provide updated registration figures or estimates for each diaspora country, as well as the number and location of registration (and polling) sites in each. When the Panel chair referred to “a campaign by some Southern leaders to encourage people not to register and vote outside Southern Sudan” was he referring to any SPLM role or not? Separately, why is there no Office of the Spokesperson for the Secretary-General briefing on November 26? Matthew, The Panel will have 38 staff when it reaches full deployment, which is expected by the end of this month. They are paid regular salaries just like any other UN staff members. Any questions about the basket fund should be directed to UNDP. Registration sites have been visited in Canada, Ethiopia, Kenya and the United States. Staff are about to visit sites in Australia, Egypt, Uganda and the United Kingdom as well. IOM is conducting registration in the diaspora countries, so it will have the figures on the number of people registering and the number of sites. The Southern Sudan Referendum Commission will have the equivalent information for within Sudan. 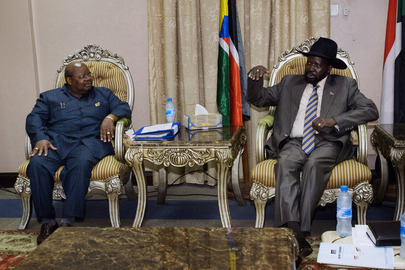 The Panel chair was referring to Southern leaders and not to any specific SPLM role. Thanks but I again ask, with emphasis: How much has thus far been paid to each of the three Panelists? What you sent implies that they are “like any other UN staff members.” Are the three Panelists paid “When Actually Employed”? When have they so far been actually employed? How much have they been paid and by / through which mechanism: UNMIS or Basket Fund? Please specify (with address) the registration sites the Panel has already visited in Canada, Ethiopia, Kenya and the United States, and will visit in Australia, Egypt, Uganda and the United Kingdom including date and who visit(ed). What is the status? What has UNMIS / DPKO / the Secretariat done? On deadline, thanks. And after 24 hours and counting, no answer at all. Watch this site. Inner City Press: I want to ask about Sudan on the statement that you made from the Secretary-General’s Panel on the referendum. There seems to be a lot of controversy about the low numbers of Southern registrants in the North. Some people are putting the number as low as 9,000. So it seemed like, in your statement, you are saying some Southerners are encouraging other Southerners — I just want to understand, because the SPLM [Sudan People’s Liberation Movement] blames it all on Khartoum. Acting Deputy Spokesperson Haq: Well, that was just a summary of a press conference that President Mkapa held in Khartoum, and I’d just refer you to the transcript of that. We have that available in our office. Inner City Press: And does the Secretary-General’s Panel have any role in overseeing these sites, these eight Diaspora voting sites in Africa, the United States, Australia? Are they going to visit any of those sites? And there is some controversy now about the IOM [International Organization for Migration] role in it. It’s not exactly clear to me who is funding the IOM for that work, but what is the Panel’s role on these other sites? Acting Deputy Spokesperson: No, you can check with the Panel itself about the sites. It’s looking at the whole referenda process, which includes sites for Southerners to vote in the North. Inner City Press: But isn’t his Panel — I have had some problem in the past getting responses from the Panel, so I just wanted to know, it’s the Secretary-General, he set up the terms of reference, it’s his delegated Panel, right? UNITED NATIONS, November 24 -- On Sudan, the UN is either negligent or deceptive or both. Repeatedly this month Inner City Press has asked the UN to confirm or deny reports by rebel groups in Darfur of government attacks and bombings. Acting Deputy Spokesman Farhan Haq has said he will look into it, or that Ibrahim “Gambari is in Darfur,” or on November 24, that UNAMID's report of its daily activities doesn't mention the bombings, so they are not confirmed. Video here, from Minute 8:25. But UNAMID's daily reports are full of happy talk, about the number of patrols conducted. They never mentioned that UNAMID had not visited much less protected civilians for months in Jebel Marra. 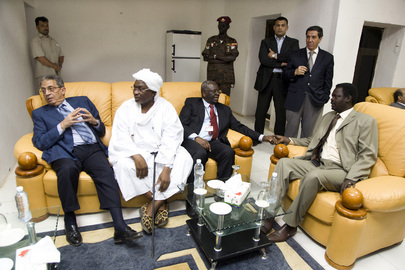 On November 24, Inner City Press asked Haq if Gambari or mediator Djibril Bassole have any comment on the break with Khartoum by Minni Minnawi, the lone Darfur rebel who signed a deal with Omar al Bashir. No, there was no comment. Ban Ki-moon on November 22 said he had made Darfur his major priority. Now there are no answers, no comments, no monitoring, nothing. On November 22, Inner City Press asked whether the panel named by Ban Ki-moon has jurisdiction over, and anything to say about, the polling sites outside of Sudan for the South Sudanese diaspora. Haq declined to answer, saying to ask the panel's spokesperson. But isn't it Ban Ki-moon's own panel? Can one outsource supposed concern? Ban's spokesperson's office canceled its noon briefing on November 26. Inner City Press: on Sudan, there are also reports again in Darfur of fighting between the SLA [Sudanese Liberation Army] and the Government in [inaudible] in Darfur. And I wanted to… yesterday, this is now, there are four separate allegations, some by JEM [Justice and Equality Movement], some by SLA, of fighting with the Government. And I am just wondering there hasn’t been either a confirmation or denial by UNAMID [African Union-United Nations Hybrid Operation in Darfur]. Is UNAMID aware of this report and what does it say about these now mounting reports of escalating fighting in Darfur? Acting Deputy Spokesperson Haq: Well, we’ve received different information from UNAMID about their daily activities; it does not include a confirmation of this particular burst of fighting. Inner City Press: On the previous ones that have… of the report by JEM of a week’s worth of bombing in the Jebel Marra area, is that something that the UN, UNAMID, has tried to figure out if it’s taking place or…? Acting Deputy Spokesperson: Well, with UNAMID’s mandate, they try to monitor any violations of the agreements on the ground. But they do not — they have not provided a confirmation on this. Inner City Press: And now that Minni Minawi, who previously had been on board with the National Congress Party, has now come out and said that the National Congress Party has violated the Darfur Peace Agreement and is basically, I am just wondering, this seems like a major development, in that the one peace agreement in Darfur is falling apart, or at least the leader of Minni Minawi’s faction is saying that it’s falling apart. What’s UNAMID’s or Mr. [Djibril] Bassolé’s response to that? Acting Deputy Spokesperson: I don’t believe that he has responded to the particular comments of any precise party. If he does have a comment on what Minni Minawi has said, we will share it. Ban's spokesperson's office canceled its noon briefing on November 26, and has now been asked "why?" Watch this site.